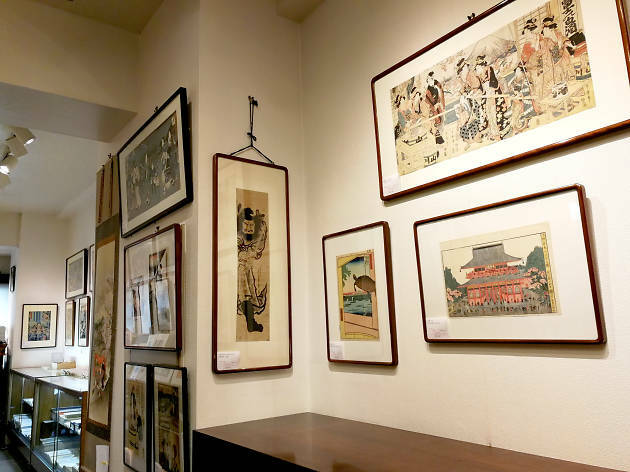 Hara Shobo is an ukiyo-e lover's dream: they have what is arguably one of the city's best collections of woodblock prints from the Edo and Meiji eras, while also offering new prints. The company issues a catalogue, Edo Geijitsu (‘Edo Art’), at least twice (but often up to four times) a year, depending on how many prints they manage to amass. 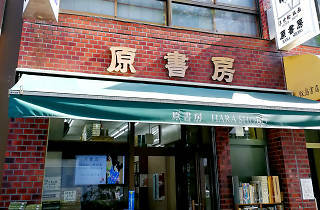 The staff speak good English, and with prices going from the extremely cheap (¥300 for a reprint) to the astronomical (¥2,000,000 and upwards), you'll be sure to find something to suit your taste and budget here. 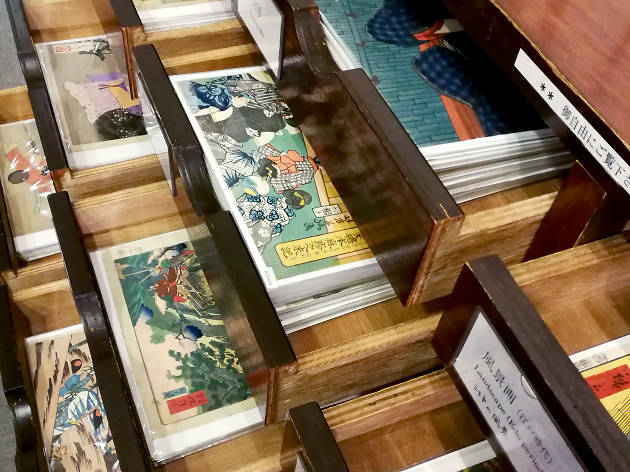 As one of the staff members put it, 'seeing ukiyo-e in this shop is probably more fun than in a museum, because here you actually get to touch them too.' Considering the very detailed explanations (how to spot a good print, the stories behind the prints and so on) they like to give prospective buyers and casual browsers alike, we'd agree. 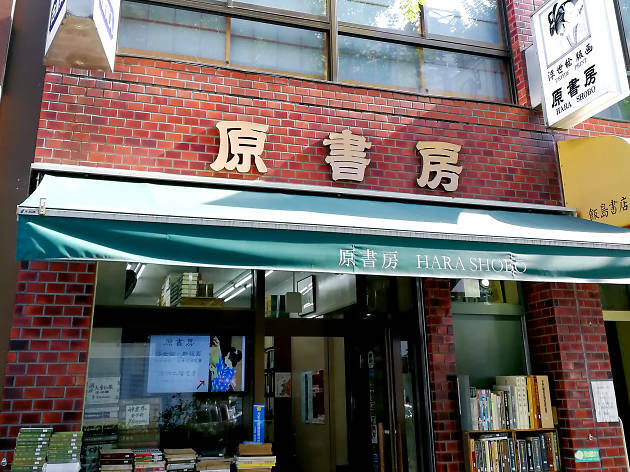 Note that the ground floor is reserved for a variety of non-woodblock related books; head straight to the second floor for the ukiyo-e goods. I'm an avid ukiyo e collector and came to japan for the first time, staying in the Jimbocho area specifically to look for prints. Hara Shobo has a great collection of prints priced reasonably. They have drawers that specify the type of prints in the drawer. 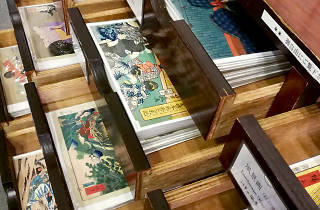 You can open any of these drawers and peruse the prints. The label on the drawers are separated by Meiji or Edo Periods as well as by subject: War prints, Beauties, Landscape, Actors, Triptychs, Inexpensive prints. I ended up spending close to 3 and a half hours here, going through the prints. Satomi Kawahara, who works at Hara Shobo, approached me and asked about which prints held the most interest for me. She gathered other prints not in the drawers that were recently picked up at auctions and estate sales that suited my interests. She also showed me some damaged prints that were less expensive but by very famous artists like Yoshitoshi. She was so generous with her time and was able to answer questions about prints that I own, and some of the stories and plays depicted in the prints. After a few hours, I had selected about 10 prints to purchase. She said she would hold them for me, but that I should go around to the other shops in Jimbocho to see what they had and compare prices. She made a map of the many shops that deal in ukiyo e. It was an incredibly generous thing to do. 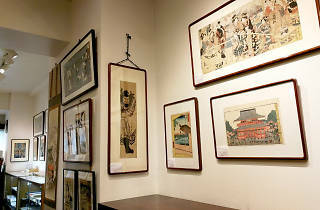 When I returned, she had found information on the prints I was interested in purchasing, including stories of generals, wars, and kabuki plays that were depicted in the prints. She answered so many questions that I had about prints and I could tell that she was excited to have someone so interested in the history and culture of the prints and of the folk lore and religious background of Japan. She also brought out one of the lots of prints that hadn't been catologued yet for me to look through. I can't recommend Hara Shobo and Satomi highly enough. Great business, great staff, great products.